Starting October 1, 2016—The 2017–18 FAFSA becomes available on October 1, so you can fill it out that day or any time through the federal deadline mentioned below. Just get it over with. Midwinter—Did you know that a lot of colleges and state higher education agencies look at your FAFSA to determine what financial aid they can offer you from their own funds? Most schools will have their own deadlines for the FAFSA. In my experience, most were around February 1 and March 1 (although some may be a little earlier now that the FAFSA is going to launch earlier). And your state may have a deadline that is even earlier than the school’s. Make sure you check your state deadline and each school’s deadline. By June 30, 2018—This is the federal deadline for the 2017–18 FAFSA—meaning, if you qualify for a Federal Pell Grant, you can apply this late and still get one. Luckily for you it’s not actually that bad. As of this year, the FAFSA asks for older tax info than it used to. So for the 2017–18 year, you’d need your tax info from 2015, so you already have it! Some aid you can get from the FAFSA isn’t based on financial need; there are a lot of academic scholarships that require you to submit a FAFSA. Do you really want to take yourself out of the running for that free money? It usually takes less than a half-hour to fill out the FAFSA, so put that phone down and try again; and it helps if a parent helps you out. In summary: fill out your 2017–18 FAFSA as soon as possible after October 1, 2016. Megan Friebe is a sophomore at Michigan State University, where she spends her days studying public affairs and social policy, her evenings studying the same thing, and, if she’s lucky, her nights sleeping. She also manages to find time to intern with the Customer Experience team in the office of Federal Student Aid at the U.S. Department of Education. Our 2015 income was more than our 2016/2017 income due to the fact that I had to quit work to take care of my special needs daughter. Do I still have to use the 2015 tax info? I would think that my daughter in college would receive more financial aid this upcoming year since our income is less? Do I need to fill out a separate FASFA for each of my kids? My son is already in college but my daughter will be going fall of 2017. Can I use the current one I have for my son and send that or do I need to start over? Yes. Separate for each kid. The FAFSA is unique to one individual, which is the person going to college. Each person going to college needs their own FAFSA. You can use the same FSA ID (as a parent) to sign both of their FAFSAs. Each child needs their own FSA ID. After your first child completes their FAFSA, there is a link at the end to transfer parent information to a sibling’s FAFSA. You can select this option and begin your second child’s FAFSA. My daughter did not qualify last year. I am clueless why not.I am a single Mom with no extra income. I am a middle school teacher. Should she apply again? We definitely understand that free money, like grants and scholarships, are the preferred type of financial aid because they don’t have to be paid back. Many of the grants we offer, including the Federal Pell Grant, are “need-based”, meaning you must have certain level of financial need to qualify. Your school will use your FAFSA information to determine whether you qualify for these grants, and if you do, you’ll get them. If you still have a gap between what your school costs and the amount of grants, scholarships, and out-of-pocket funds you can afford to pay, federal student loans can be a good option. Federal student loans offer several advantages over private student loans and most people qualify. Just make sure to borrow only what you need! If you want more free money, make sure your daughter applies for scholarships. There are tons out there! Can my daughter apply for her second semester? She applied last tera snd appatently she did not quality for anything. I am a single mom, a teacher in middle school and I really I Know I do not have money for her college education. Should she try again? Things like her year in school, family income, and cost of attendance at her school are just a few factors used to determine her aid. You never know what aid you may get if you don’t complete the FAFSA, so don’t let last year’s award deter you from potential aid you may receive this year. My husband and I used our parents’ tax information for the 2016-2017 year and were not yet married. Do we use that information again? if i plan on going to college for 4+ years do i need to fill out the FAFSA application every year ? or just update it ? If my daughter is applying to college but plans on a gap year so will defer should i still fill out the fafsa anyway? You only need to complete a FAFSA for the school year you plan to attend college. So the short answer is no, but check with the school’s financial aid office for details on deferring for a year and how that will affect aid. How much assets affect things depends on parent age, income. You can look up asset protection allowance posted in the 2017/18 EFC formula. Parent assets are assessed at about 5%. You can even calculate your EFC with the EFC formula or Collegeboard EFC calculator to see if waiting to pay tuition bill would make sense. This article is most important for low income students with very low EFCwho might miss out on state aid by waiting too long if they live in a state that has “first come first served” aid. The amount of aid missed out on might be several thousand $ whereas the EFC impact of assets now versus in December might be minimal. With the change in filing date, I am concerned that my EFC will be higher than if applying in January since the Spring semester bill will not have been paid yet. Does the 2017-18 take this into account? It is your choice as to when you file your FAFSA, but keep in mind all your deadlines mentioned above and how some sources of aid are limited. I thought applications had to be completed before fafsa should be completed. Correct? yes, you wait till you apply. 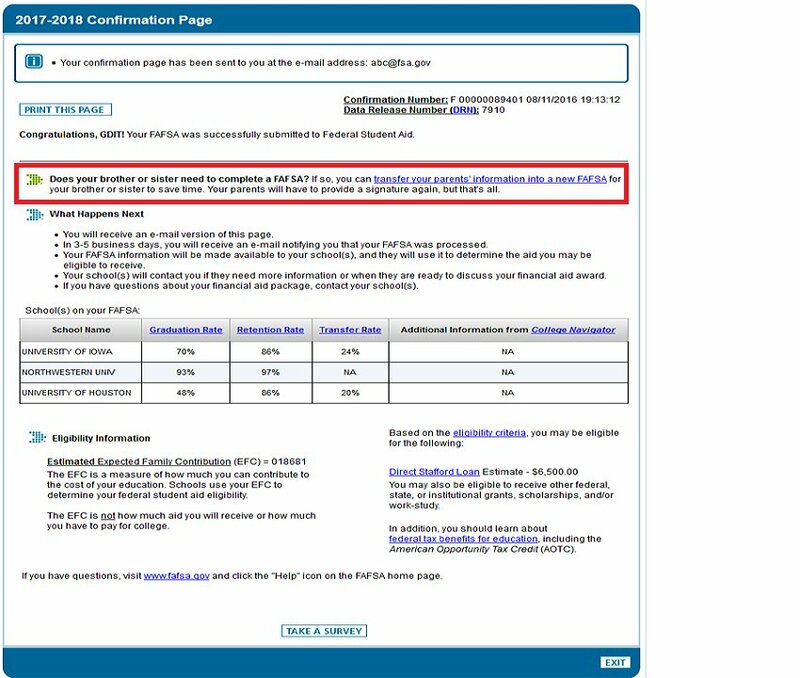 No, applications do not have to be completed before you do the FAFSA. It’s best to get the FAFSA done and out of the way ASAP then focus on college applications. Should we fill out a fafsa for grad school? Just completing four years at a state school. Yes, you should still fill it out. Although there are no grants awarded for grad school, there’s still opportunity for loans. If awarded loans, you don’t have to take them but it’s great to still have the loan available to you in case you ever need it. Also, if during your time in grad school you decide to apply for any financial assistance, you are usually required to show proof that you completed your FAFSA. You can. Here are the types of financial aid we offer to grad students: https://studentaid.ed.gov/sites/default/files/graduate-professional-funding-info.pdf. My understanding is that the deadline for the 2017-2018 FAFSA is June 30, 2018. Please make sure this is updated. Thank you. We updated it. FAFSA is a joke! Being the stepfather is not paying for college by any means but me (mother) alone, and real father has not been in picture for many years. FAFSA still looks at household income and step dad makes 3xs more then me. Important information to help our students and their families! Thanks for the updates.